PILDAT launches Report on Mapping Future Political Leadership of Pakistan including those who are most likely going to be political leaders in future and those who have the potential to be the future political leaders. August 18, 2015: In a systematic effort to map the future political leadership of Pakistan, PILDAT has identified 21 leading political personalities of Pakistan projected to become Prime Ministers in the next 10-15 years’ time. PILDAT has identified these personalities based on the promise and potential they have shown and compiled their profiles in the form of a book with the specific aim of highlighting the roles they play as political leaders for the people of Pakistan. The exercise of developing fact-based and concise profiles of such leaders is aimed at informing and facilitating citizens for their engagement with such political leadership and to enhance public focus and critical appraisal of the leaders that will help future leadership development. The top 21 identified leaders are (in alphabetical order): Ahsan Iqbal, Aitzaz Ahsan, Asad Umar, Aseefa Bhutto-Zardari, Awais Ahmed Khan Leghari, Bilawal Bhutto-Zardari, Chaudhry Nisar Ali Khan, Hamza Shahbaz, Hina Rabbani Khar, Humayun Akhtar Khan, Imran Khan, Ishaq Dar, Khurram Dastagir Khan, Liaqat Baloch, Marvi Memon, Maryam Nawaz, Mushahid Hussain Sayed, Omar Ayub Khan, Shah Mehmood Qureshi, Shahbaz Sharif and Shazia Marri. About half (11, to be exact) of the identified future leaders come from PML-N including three close members of Prime Minister Nawaz Sharif’s family. Apparently, Shahbaz Sharif is the front-runner according to the PILDAT assessment. Five of the potential future leaders are from PPP out of which two are the children of Benazir Bhutto and Asif Ali Zardari. Future potential prime ministers’ list includes three persons from PTI including Imran Khan. Two other hopefuls are one each from PML-Q and Jamat-e-Islami. 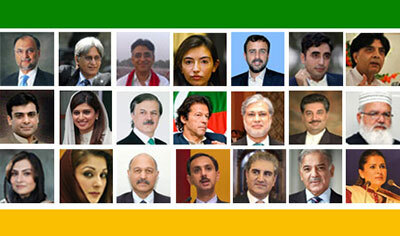 The 21 potential future Prime Ministers of Pakistan have been evaluated based on the PILDAT-devised 13-point criteria that includes Role in political party; Engagement with public; Charisma; Demonstrated ability to run a government at any level; a clear Vision about future of Pakistan; Level of understanding about political issues; Level of knowledge about internal affairs; Financial integrity as indicated in the statements of assets and liabilities and taxes paid; any Legally documented criminal record; Independence of views, Stances on political issues; Demonstrated capacity to transcend differences; Potential and likelihood to become Prime Minister of Pakistan in the next ten to fifteen years. The profiles shed light on the identified leaders’ socio-political careers and give an account of their personal and political journey, major influences in life, elected and other offices held and holding, political affiliations, financial transparency, achievements and major positions taken on ideological, political and social issues. The data used to produce this book has been taken from various sources including mass media, publications, official websites of individuals and face-to-face interviews in some cases. The 21-member steering committee formed by PILDAT for guiding and reviewing the PILDAT compilation met four times but no clear consensus could emerge among the committee members about the criteria of selection or the persons to be included. The final compilation reflects the work undertaken in-house at PILDAT.